It's a public holiday here - Auckland Anniversary Day. I'm not sure what exactly we are meant to do to celebrate, so I'm planning a whole heap of nothing! Chris is working tonight, from 11pm to 7am. So I'm trying to be VERY QUIET. Which means no vacuuming, singing along to music, or watching TV because he needs to get some sleep while the sun is shining. The best thing I could come up with was to sit outside, read a magazine, and eat some fruit. Coincidentally for the Year of the Dragon, I bought a dragonfruit! See if you can find one - they are tropical, so usually imported and expensive. But MY GOODNESS they are worth it! 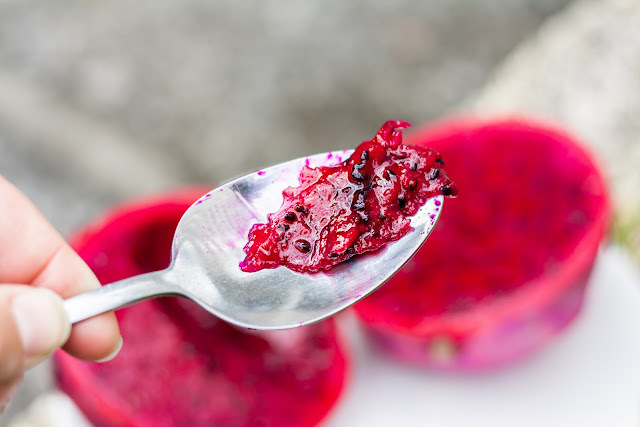 I've always wondered what the inside of a dragonfruit looked like. And now I know!! Also, hurrah for public holidays! 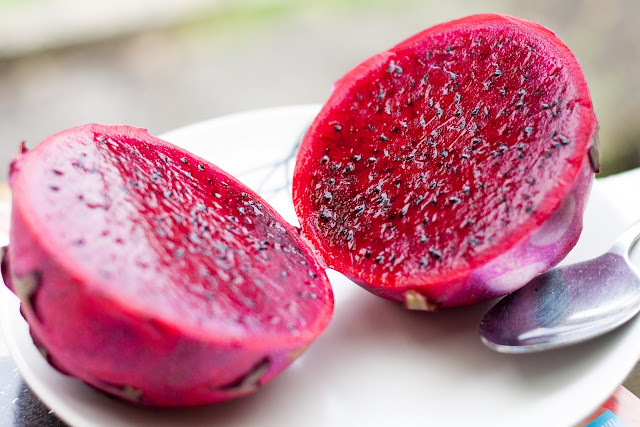 Apparently there are some different colours of dragonfruit (according to Wikipedia), but all the ones I've eaten have looked the same. I should probably have noted that it can make your wees go pink as well... for those who may be alarmed by such things! I so need to find me one of those dragonfruit. They look (and sound) incredible.